After a lovely day at the beach in the 30 degree weather, it was time to head home. 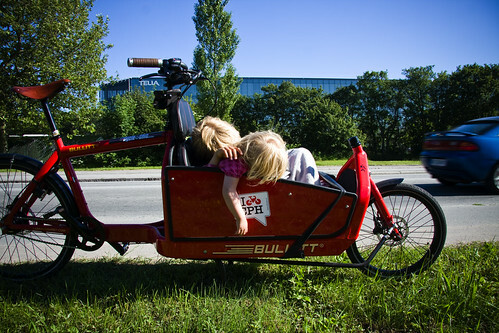 The Mother of My Children had all the gear in her two-wheeler Christiania Bike and I had the kids on the Bullitt. 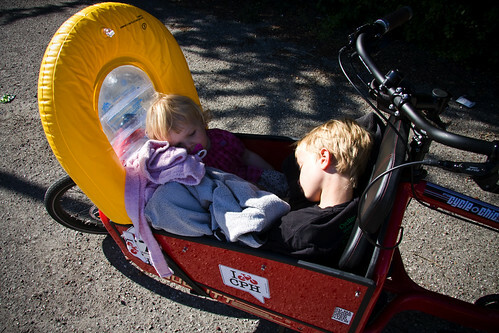 It was a long, lovely day and both of the kids faded quickly once onto the bike, lulled to sleep by the gorgeous movements of the bicycle. Usually Felix stays awake and can hold Lulu up with his arm around her, but this time he snoozed. Lulu ended up in a rather funny - and uncomfortable - position. We stopped and I rearranged them. I used the inflatable kickboard as a pillow and Lulu was happy to lean up against it. Felix could then use a pile of towels as a pillow. Lulu couldn't get back to sleep (good thing, otherwise she'll be up all evening... :-) ) and this shot is one that warms my heart. 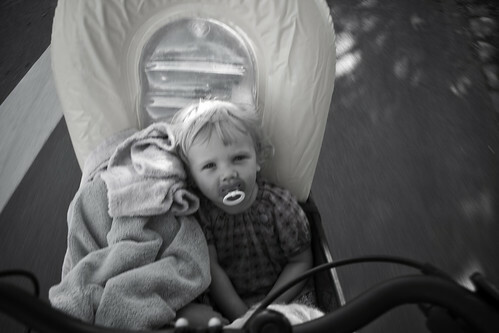 Cycling home through Copenhagen in the evening light, staring down at my girl - her staring up at me. 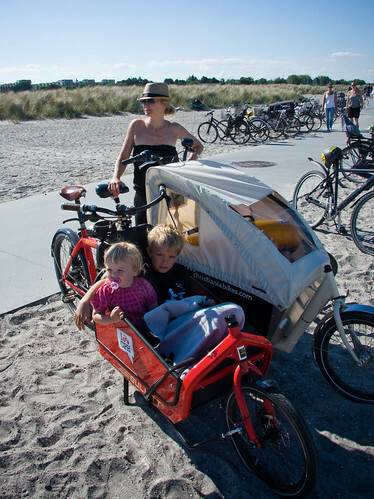 The beauty of the togetherness that the bicycle gives us all.